10th grade grammar might seem redundant to anyone who was paying attention to the last ten years of their language arts education. 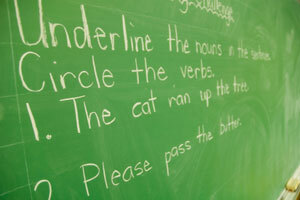 The grammar 10th graders learn is more to inculcate in their minds the most important components of English grammar. A firm grasp on 10th grade grammar will prepare students for composition courses in the coming years. What can be more important about grammar than parts of speech? Without knowing the parts of speech, there's no way for everyone to get on the same page when it comes to grammar. Noun: Person, place, or thing. Man, dog, college, and orangutan are all nouns. Verb: Any action or anything being done. Kick, jump, study, and swing are all verbs. Helping Verb: Verbs like have, do, and be that help indicate the tenses of main verbs. In a sentence like "I have done my homework," "have" helps "done" show its tense. Conjunction: Words that help combine sections of sentences and join separate elements. In the following sentence, "and" is a coordinating conjunction connecting two complete clauses. "The orangutan attacked the dog and I saved it." Adjective: Words that describe nouns. "Tall" and "black" are the adjectives in this sentence: The tall man walked the black dog. Adverb: Words that describe verbs or when and how things are done, often ending in "ly." The lazy man walked slowly. The orangutan swiftly kicked the dog. The dog went to bed early. Pronoun: A word used in place of a noun. It, he, and they are all pronouns. I am a lazy man. Clauses: An independent clause contains all of the grammatical elements necessary to make its own sentence but is a complete idea within a sentence. In "The orangutan kicked the dog, but I saved it," a comma and a coordinating conjunction separate the independent clauses. Each independent clause usually contains a subject, a verb, and an object. A subordinate clause is a clause patterned the same way as an independent clause but functions within sentences as adjectives, adverbs, or nouns. An adjective clause is a clause that behaves like an adjective, describing a noun. The orangutan that kicked the dog escaped. An adverbial clause is a clause that behaves like an adverb, describing an action or verb. When the sky was dark, the orangutan crept away. A noun clause is a clause that behaves like a noun. Whoever meets that orangutan will be a sorry fellow. Parallelism: When ideas are closely linked in the mind of the writer, they are easier to grasp by the mind of the reader when presented in parallel grammatical form. The orangutan is not your friend, the orangutan is not kind, and the orangutan is not to be trusted." When training a dog, be careful; when training an orangutan, be doggedly careful. There are many different types of sentences, and they take some time to remember, but they're important to get down. Simple Sentence: An independent clause with no subordinate clauses. Compound Sentence: Two or more independent clauses with no subordinate clauses. I like dogs, but I don't like orangutans. Complex Sentence: One independent clause with one or more subordinate clauses. When it's dark outside, I'm afraid of orangutans. Compound-Complex Sentences: At least two independent clauses and at least one subordinate clause. Orangutans that have been trained not to kick dogs are all right, but I still don't like them. Commas come before coordinating conjunctions. If you have two independent clauses joined by a coordinating conjunction, you always need a comma. The orangutan is evil, but the dog is good. The orangutan is red, and the dog is black. Commas come after any introductory phrase. Sometimes sentences require introductions. The introductions come before the subject, before the independent clause starts. Under the cover of darkness in the middle of the night, the orangutan waits. Aware of the orangutan's presence, the dog is wary. Commas come between all items in a series. This comma is called the serial or oxford comma; it acts as a spacer between units. Orangutans are clever, resourceful, and stealthy. Dogs like fire hydrants, bouncy balls, and treats. McCartney and Lennon, Simon and Garfunkle, and Slash and Axl are the greatest musical duos of all time. Every 10th grade class is bound to be slightly different, but the main idea is to lay a foundation of grammatical elements onto which students can begin to build a repertoire of rhetorical devices. In the coming years, they will learn how to think critically about issues and topics and to argue positions in an organized way. The hope is to make them more able to present their ideas and to interpret accurately the ideas of others. They are entering adulthood and need all the help they can get. Language use is one of the major factors by which adults and children are differentiated. 10th grade grammar is kind of a rite of passage. "10th Grade Grammar." YourDictionary, n.d. Web. 24 April 2019. <https://education.yourdictionary.com/for-teachers/10th-Grade-Grammar.html>.